The Cisco"Premium" PoE line card has all of the PoE features of the "Classic" and E-Series PoE card with the addition of future software upgradeability to support up to 30 Watts per port. The Cisco Classic line cards provide 6 gigabits of switching capacity per slot. E-Series line cards increase the per slot switching capacity to 24 gigabits. This increase in per slot switching capacity with the E-Series line cards requires the Cisco chassis and the Cisco Supervisor Engine 6-E. Classic line cards may be deployed in both classic and E-Series chassis with either classic Cisco supervisor engines or with the Supervisor Engine 6-E. With the Supervisor Engine 6-E, the classic line cards per slot switching capacity remains at 6 gigabits per slot. However, because of the centralized switching architecture of the Cisco line cards, the classic line cards will adopt all of the Supervisor Engine 6-E features such as eight queues per port, dynamic QoS, and hardware-based IPv6 routing. 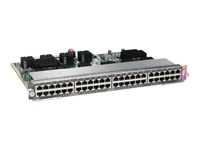 Classic line cards and E-Series line cards may be mixed and matched within a Cisco chassis with no performance degradation: classic line cards will operate at 6 gigabits per slot, and E-Series line cards will operate at 24 gigabits per slot.